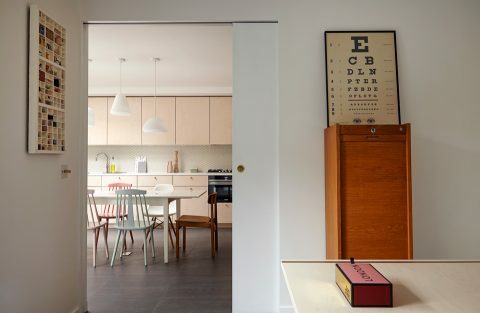 Located on an urban infill site in close proximity to the river Quaggy in south-east London, 31/44 Architects have recently completed this two-storey detached house. The house was built by one of 31/44’s directors – his second self-build within the same street. The form and arrangement of the house is derived from a response to the immediate context and site conditions – the street is a conventional Victorian terrace on one side but opposite is a more ad-hoc assembly of fences, walls, mews and garage buildings sitting at the rear of long gardens to large houses on the next street. It is this side of the street that Number 49 is located. 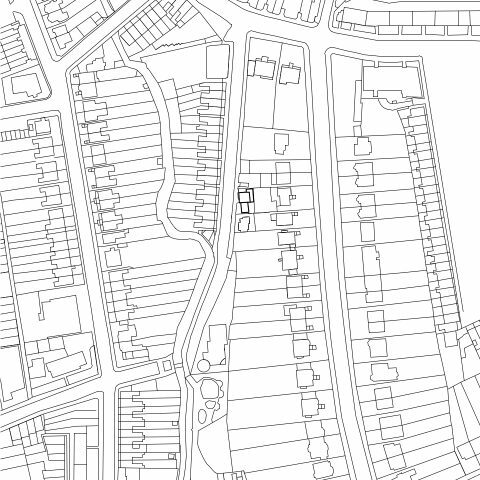 The consequent, perhaps sub-conscious reaction to the site, was to assert permanence – to produce a house with significant visual mass that would begin to define the beginnings of a completed street. 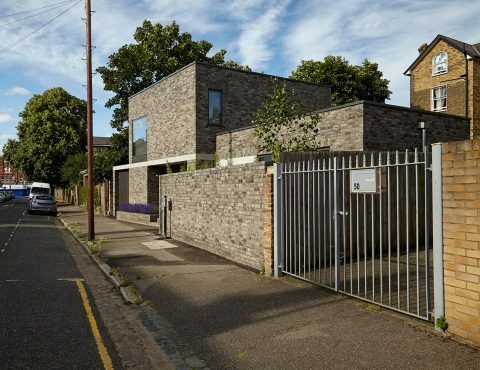 The building is raised from the street to alleviate flood risk concerns with a simple staggered rectilinear footprint at ground level and the first floor mass located towards the northern boundary of the site. This arrangement established the relationship of internal and external living spaces whilst taking advantage of the south facing aspect of the site. Large openings capture views of surrounding trees and the courtyard gardens. The southern section of the plan, containing the main living spaces, sits between the two principal courtyards. To the rear, the client’s studio catches the southern light. 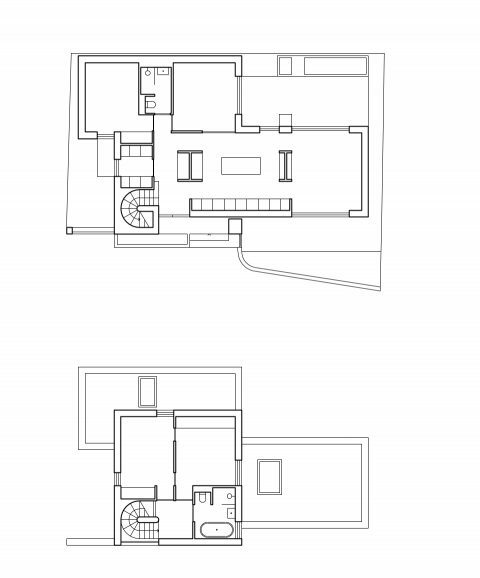 The guest suite is located to the rear with a view into the third, quiet, external courtyard space. 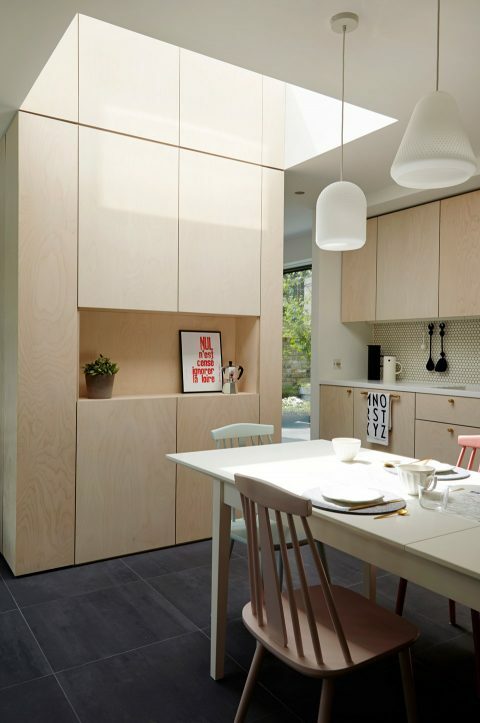 Internally, throughout the house, are a series of birch-faced joinery cabinets. They divide space, create framed views and also form containers for the client’s possessions, who is a stylist, collector and curator. 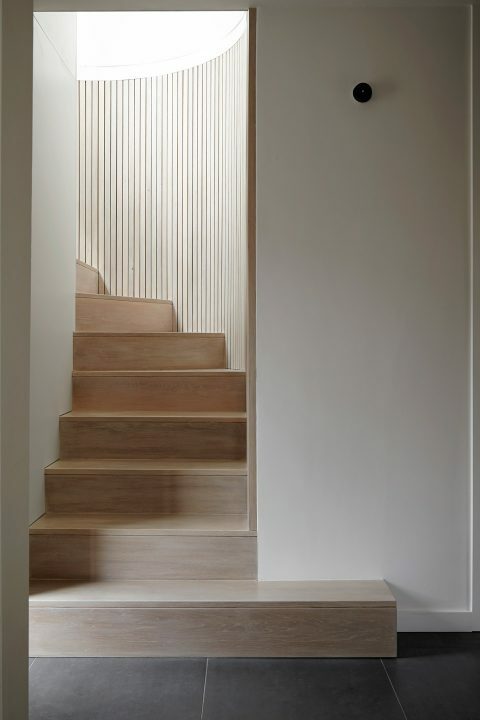 The joinery, with its contents, define the character of the house. 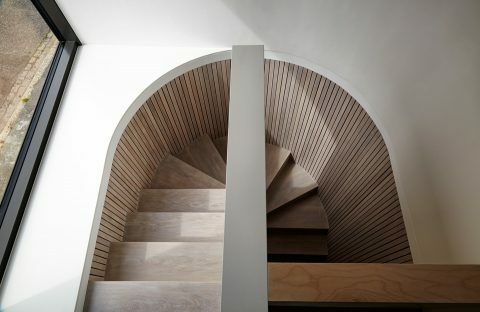 The first floor is accessed via a curved timber staircase with large picture window overlooking the street. 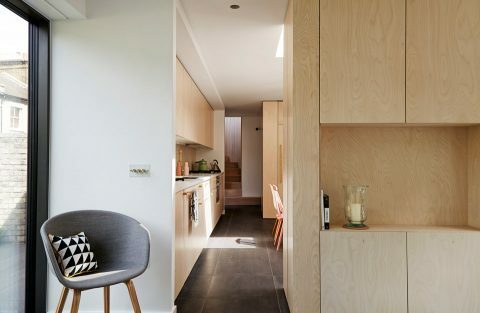 The master bedroom faces south towards the river and nearby park with connecting doors through to the third bedroom offering a flexible layout of spaces with each catching glimpses of the surrounding trees. At street level the house has a a set back entrance door, planting, steps and gates to the two front courtyards. This creates a careful threshold to the street but responds to the ad-hoc ground level activity on this side of the street. The first floor, by contrast, is formed of a flush brickwork panel and window sitting upon a concrete lintel that holds all of these elements together. It provides a visual mass and presence that begins to define the emerging mews buildings. The first self-build project by the River Quaggy can be viewed here. 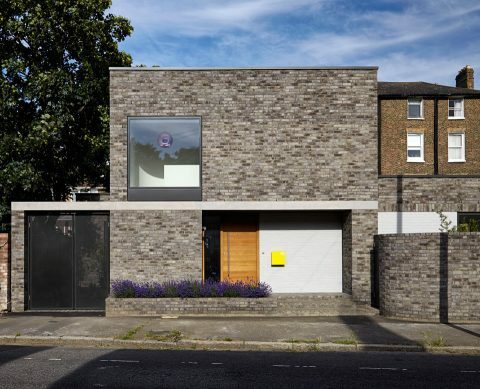 The house won an RIBA London Award and Regional Small Project Award and RIBA National Award in 2017 and was longlisted for the RIBA House of the Year.